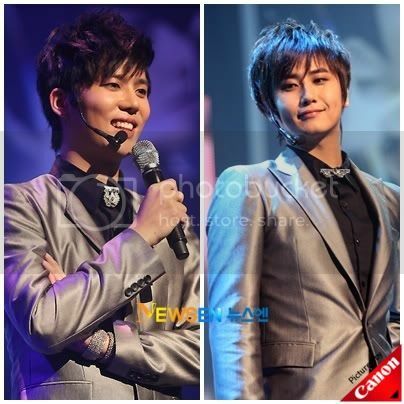 Heo Young Saeng and Kim Kyu Jong, has joined a new agency. Now all five members of SS501 belong to an agency....and I feel much better . Congrats to Kyu and Saengie !! SS501 members Heo Yeong Saeng and Kim Kyu Jong will soon be “eating off the same plate” as Lee Hyori, as it was just revealed that they have officially decided to join her new label B2M Entertainment. The two SS501 idols are said to still be on good terms with the CEO of their former management company, DSP Entertainment. In addition to pursuing their music careers, they plan to add acting on their resumes in the future. Despite the members being split up amongst different agencies, they have all asserted that ss501 will still remain as a group. Btw, yesterday we were saddened to hear about Jung min being sick....he collapsed due to fatigue and had to be taken to the hospital...resting at home now ! Oh, Jung Min has to take a good rest and take good care of himself...doesn't he have that Mountain Climbing event at the 30th this month?....uhh....that's not too far away !......more power to you Mal, plz drink some supplements and get enough rest at home . If you haven't read about it, just click here.